More and more homeowners in the UK are also avid pet owners. So why not improve your home for your pet by letting them enter your home when they want by having a cat or dog flap installed into your existing door, window or conservatory. With easy access to the outside, your pet will get more fresh air and is more likely to exercise whilst making life more convenient for both you and your pet. Not only are our cat and dog flaps installed traditionally into back doors, we can also install them into patio doors, conservatories and even windows, whichever suits your home and your family. 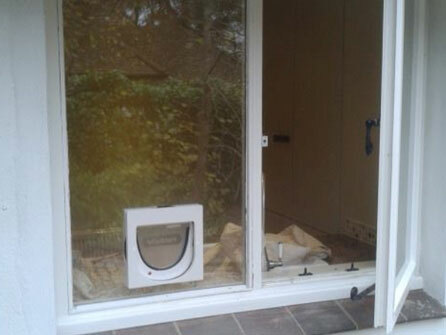 When installing a cat or dog flap into a double glazed unit, it is necessary to change the unit as opposed to modifying it as the toughened glass is too tough to cut. Restrict your pets from coming in or out of your home by different solutions that our cat and dog flaps offer, speak to a member of our team for more information on the solutions available. 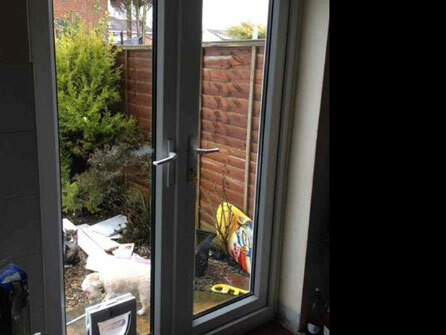 Homeowners are advised to buy their own cat and dog flaps which are readily available on the high street, call our team to give them the model and the size and then we can come along and conveniently fit it into your door, patio door, conservatory or window, it couldn´t be easier. There are a range of different brands and models on the market today. Cat and dog flaps can be lockable, come in various sizes, have microchips and operate in a two way direction to enable your pet to come and go freely. If you have trouble buying a suitable flap then contact a member of our team who will gladly offer you helpful advice on where to purchase one suitable for your home. Make an appointment with Glaze-fix Windows & Door Ltd today to get your cat or dog flap installed by the experts, call us today on 01256 850560, we are waiting for your call.